October 23, 2018 – The Joan Mantle Music Trust celebrates eleven years of excellence. Funding is now being distributed to elementary schools as well as secondary schools offering music programs. To date, the Trust has raised over $240,000, and all Rainbow secondary schools have received three rounds of funding. Schools receiving instruments in 2018-2019 include Lo-Ellen Park Secondary School, Algonquin Road Public School and R.L. Beattie Public School; Confederation Secondary School, Valley View Public School and C.R. Judd Public School; and Manitoulin Secondary School, Central Manitoulin Public School and Charles C. McLean Public School. October 12, 2017 – Tune Up the Trumpets! 2017-2018 marks the 10th year that the Joan Mantle Music Trust will be distributing funding to secondary school music programs in the Rainbow District School Board. The Trust has raised $220,000 since it was established in November 2008. Confederation Secondary School, Espanola High School and Sudbury Secondary School will receive funding in the 2017-2018 school year. September 26, 2016 – The Joan Mantle Music Trust has surpassed $200,000 thanks to generous donations from local businesses and individuals. Chelmsford Valley District Composite School, Lasalle Secondary School and Lively District Secondary School will receive new instruments in the 2016-2017 school year. September 25, 2015 – The Joan Mantle Music Trust has reached $180,000 thanks to the generous donations from local businesses and individuals for the benefit of students in Rainbow Schools. Barrydowne College, Lockerby Composite School, Lo-Ellen Park Secondary School and Manitoulin Secondary School will receive new instruments in the 2015-2016 school year. September 23, 2014 – The Joan Mantle Music Trust has surpassed $150,000 as local businesses and individuals continue to make donations for the benefit of students in Rainbow Schools. Confederation Secondary School, Espanola High School and Lively District Secondary School will receive new instruments in the 2014-2015 school year. September 24, 2013 – Rainbow District School Board’s secondary schools continue to benefit from the Joan Mantle Music Trust, which celebrates its fifth anniversary this year. Chelmsford Valley District Composite School, Lasalle Secondary School and Sudbury Secondary School will receive new instruments in the 2013-2014 school year. September 25, 2012 – Thanks to the generosity of the community, Rainbow District School Board’s secondary schools will continue to benefit from the Joan Mantle Music Trust. Lo-Ellen Park Secondary School, Lockerby Composite School, Manitoulin Secondary School and Barrydowne College will receive new instruments in the 2012-2013 school year. To date, close to $107,000 has been raised for the Joan Mantle Music Trust, through individual donations, corporate contributions and special events. June 27, 2012 – Awards were presented to Tyler Makinen of Lively District Secondary School, Yanna Manolioudakis of Confederation Secondary School, Kyle McColeman of Espanola High School, Michael DeSanti of Lo-Ellen Park Secondary School, Michelle Potvin of MacLeod Public School and Christian Williams of Sudbury Secondary School at recent awards ceremonies to commemorate their excellence in music, academics and community involvement. February 12, 2011 – Over $12,000 was raised in support of the Joan Mantle Music Trust at the Rainbow District School Board’s first International Dinner. The evening featured student entertainment, a silent auction and foods from around the world. Click to view photos from the evening courtesy of SNAP Sudbury. September 23, 2010 – Chelmsford Valley District Composite School, Lively District Secondary School and Manitoulin Secondary School receive new instruments from donations to the Joan Mantle Music Trust. September 23, 2009 – Students receive new instruments from donations to the Joan Mantle Music Trust. Thank you for your generous support of the Joan Mantle Music Trust. The Joan Mantle Music Trust was established in 2008 to help refresh, modernize and revitalize school music programs in the Rainbow District School Board. It is the goal of the trust, with your help and generosity, to replace, where necessary, musical instruments that have given such great pleasure beyond their serviceable life. Arts education requires materials, equipment and instruments in order to keep abreast of changing art forms as well as the simple wear and tear over time of equipment and musical instruments. Much of the current inventory of musical instruments has been fully enjoyed by generations of aspiring musicians, some of whom have gone on to professional careers in the arts. The Rainbow District School Board is justly proud of the excellence of its arts/music programs, students and dedicated teachers. In order to maintain and go beyond the current level of excellence, supplemental funding is essential to support and expand the inventory of instruments. The Joan Mantle Music Trust allocates funding for musical instruments and equipment to selected schools on a rotating basis. The Trust also accepts the donation of new and used musical instruments and allocates them to schools in need. This ensures that there is an ongoing improvement in the condition of musical equipment throughout the Board, allowing for students to achieve more in their musical studies together. When she joined the Sudbury Board of Education in 1964 to teach math and science at Lo-Ellen Park Secondary School, Principal Bruce Elliot, who was aware of her extensive background in music, invited her to establish a music program at the school. She gladly accepted and planted the seeds for what continues to be a hallmark of education at Lo-Ellen Park. Two years later, Lasalle Secondary School came calling and recruited Joan to head the Music Department. She taught music at Lasalle Secondary School for 15 successful years. The bands under her stewardship garnered numerous awards. In 1981, Joan was named Vice-Principal of Lasalle Secondary School, where music continued to flourish. She returned to Lo-Ellen Park Secondary School as Principal in 1985, where she remained for seven years. Joan then became Principal of Sudbury Secondary School where she was an ambassador par excellence for the Performing Arts Program. During much of this time, Joan was the Director of the Ontario Music Leadership Program held annually at Lake Couchiching. She also served as Director and Chair of the Ontario Secondary School Principals’ Association and played a key role in the formation of the Ontario Principals’ Council. 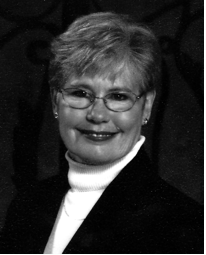 Joan spent the last six years of her career as Superintendent of Education for the Rainbow District School Board. After retiring in 2003, Joan continued to serve our community on many boards. In 2007, she was Chair of the Board of Governors of Cambrian College. Joan Mantle passed away on June 9, 2009, after a courageous battle with cancer. The Joan Mantle Music Trust is able to receive bequests of cash, shares, property and/or other assets or possessions, on the understanding that all such gifts will be used to further the work of the trust. Tax receipts will be issued for $25 or more. There are a number of different ways to make a gift or “bequest” in your will. In its simplest form, it is an asset (property, real estate, money or anything of value) that is given by an individual to an organization through the medium of a will or an attachment to a will. This is called a “codicil”. It is desirable for you to have a proper will drawn up with the assistance of a solicitor or lawyer. It is of course possible to make a will without legal advice, but incorrect or ambiguous wording, or inappropriate arrangements for the witnessing of the document, may later cause difficulties for your intended beneficiaries. Some donors choose to make a bequest in the form of a specific sum. However, the value of such a gift can be seriously eroded by inflation over the years, so it is important that bequests of this kind be reviewed regularly. All necessary provisions for close relatives and friends, the remaining (residuary) moneys and/or assets pass to the organizations and/or individuals that you have nominated as residuary beneficiaries. In drafting your will simply nominate your residuary beneficiaries, in your preferred order, and then allocate to each a proportion of your residuary estate. By setting out your wishes in this way, you ensure that your most important beneficiaries will always receive the greatest share of your residuary estate, no matter how much its contents may fluctuate over your lifetime. From the point of view of a not-for-profit organization, a Residuary Bequest is a particularly helpful form of legacy, as it does not depend on your estate being of any set value or size  variables that can change with time and circumstances. Should you wish your partner or a relative to have the use of property and/or invested capital for his or her lifetime, but with those moneys and/or assets eventually passing to the Joan Mantle Music Trust, you can make what is known as a Contingency Bequest. To make a bequest of this kind, you would include in your will a legacy in favour of a specified individual, while at the same time nominating the Joan Mantle Music Trust to receive, upon his or her death, any property and any moneys then remaining from this legacy. The following clauses are intended as a guide if you are considering including the Joan Mantle Music Trust in your will, or if you are planning to add a codicil to an existing will. These clauses are not, however, intended to be used in lieu of legal advice, and we advise you to consult your own solicitor to ensure that the wording of your bequest is appropriate for the gift you wish to make, and for your personal circumstances, particularly if you wish to make a Contingency Bequest. We also recommend that your solicitor peruse this brochure.